What is the 26th Amendment? The 26th Amendment is about the lowering of the voting age to 18 years old. Summary: The 26th Amendment was ratified in 1971, during the administration of Richard Nixon, giving 18-year-olds the right to vote. When was the 25th Amendment passed? Amendment XXVI was passed by Congress on March 23, 1971 and ratified on July 1, 1971. 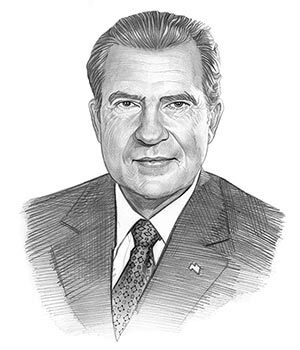 Richard Nixon was the 37th President of the United States whose presidency spanned from January 20, 1969 to August 9, 1974. One of the key events during his presidency was the ratification of the 26th Amendment to the Constitution. The cause or reason for this addition to the Constitution was the situation that arose from the Vietnam War. 18 year-old Americans could be drafted into the armed forces and forced to fight in the Vietnam War. But these same young men did not have the right to vote. The movement against the involvement of the US in the Vietnam War began with demonstrations in 1964. Anti-war protesters included mothers, students and hippies who adhered to the principles of love and peace. Anti-war demonstrations increased fuelled by terrible images in the media and the numbers of Americans killed and injured in a war being fought on the opposite side of the world. Students demonstrated in great numbers. It was time for change. Direct U.S. military involvement in the Vietnam War ended on 15 August 1973, two years after 18 year olds received the right to vote. The meaning of the word 'abridged' in this section means reduced. So neither the US government, nor individual states, can deny US citizens the right to vote based on age. The original full text of the 26th Amendment of the Constitution is as follows. Note: Amendment 14, section 2, of the Constitution was modified by section 1 of the 26th amendment. The above information provides the text, definition and summary of the amendment. The following Richard Nixon video will give you additional important facts and dates about both the personal life and political life of the 37th President of the United States whose presidency spanned from January 20, 1969 to August 9, 1974.